Anytime there's a discussion of fastpitch pitching v. baseball pitching, sooner or later the phrase "natural pitching motion" will come up. There is a belief that softball pitchers can pitch every day, all day, because it is natural, whereas a baseball pitching motion is not. The fact is, there's nothing really "natural" about fastpitch mechanics. They do tend to work somewhat better with the construction of the shoulder, perhaps, but that's a long way from natural. I think it was my friend Coach Rich who pointed out the proof to me. Watch a kid pick up a rock and throw it. He/she throws it overhand. Watch a National Geographic special and see how the indigneous population in non-industrialized countries throw rocks at game they're trying to get for dinner. They throw overhand. If you're trying to knock over pyramid of milk bottles at a carnival, you'll throw overhand. Even fastpitch pitchers will likely throw overhand. The truth is, it's a lot more natural to throw overhand than underhand. I've spoken to baseball pitching coaches who are just fascinated by the fastpitch pitching motion. These experts on pitching baseballs can't figure out how anybody can throw a ball with the kind of speed and accuracy fastpitch pitchers do. Especially female ones. They understand the overhand throw, but the underhand motion is completely foreign to them. Notice the muscles in her upper arm, forearm, hand and shoulders. Hardly looks like her body is not under stress. Actually, we all think it's kind of gross, but it certainly illustrates the kind of strain the arm and shoulder have to endure when a pitcher is putting forth maximum effort. Understand she is not a "power pitcher" either. She's small and light, more of a finesse pitcher who needs to hit corners, change speeds, and move the ball in order to succeed. Her speed comes from mechanics and effort, not raw strength like some. The fastpitch motion is not stress-free, nor is it "natural." One more reason why conditioning and rest are so critical to a pitcher's long-term success. And why pitchers should shut down for a little while when their season is over. If the under arm motion is not natural then why can a softball pitcher pitch in 2 to 4 games a day and a baseball pitcher can not? There are few (if any) athletic motions that are "natural". Athletic training is focused on replacing "natural" motion with a motion that is more efficient and powerful. The "Fosbury flop" isn't the "natural" way to high jump, any more than the "straddle" or "scissors" is a natural way to high jump. But, this is really just quibbling over terminology. I completely agree that coaches simply "don't care" about the damage to pitchers. 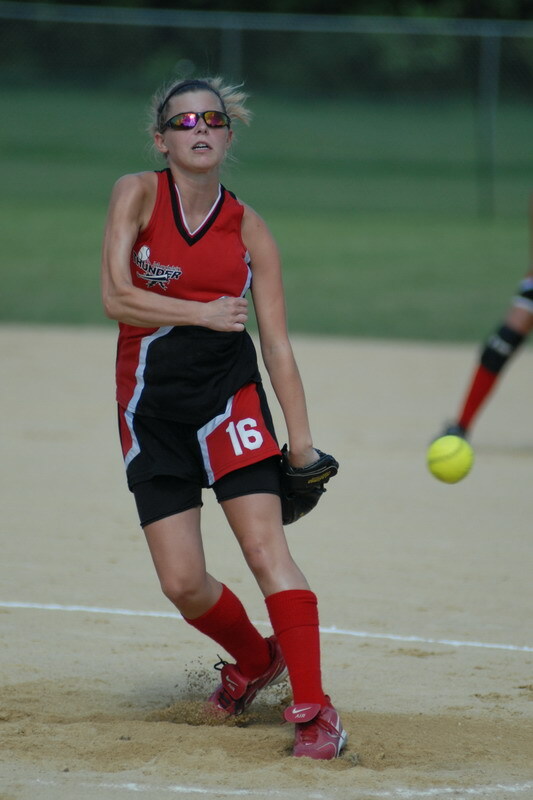 There is stress on the arm of a softball pitcher. The whole idea of pitching is to accelerate fingertips to 65 to 70 mph. Once the fingertips start going that fast, something has to slow them down--and that ends up being the shoulder muscles. This repetitious stress on the shoulder muscles will result in damage. A 2005 study found that the stress on the shoulder is the same for baseball and softball pitchers. The author of the study recommends pitchers 12 years old and under throw no more than 60 pitches per workout or game. She recommends no more than 80 pitches for 13- to 15-year-olds, and no more than 100 pitches for athletes 15 years old and over. But, everyone completely ignores the study and pretends that it is OK for an 18 year old kid to pitch 2-3 games a day. On top of that, we have a bunch of "pitching coaches" out there trying to teach 11 year olds how to throw curves and screwballs. It has become complete insanity. STAN: A baseball pitcher can pitch 2 games in a day. But, a baseball coach would be shot if he did. A softball coach merely says, "Oh, its a natural motion" and the parents, being the morons we are, simply nod our collective heads and move on like a herd of sheep. i've also seen a lot of back and arm problems in other pitchers that have come up through the ranks here with my dd. i also think just like our old football and baseball injuries, our daughters will be feeling the effects when they get older too. hey, if this motion is so "natural," why is it so hard to teach girls, or anyone for that matter, to be able to do it?